At roughly 45 feet high, the Meadowlark Dairy silo was a distinctive visual landmark. 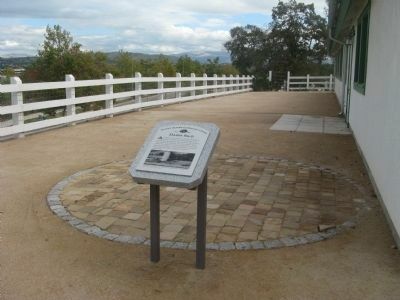 This circular paving marks the silo’s approximate location. 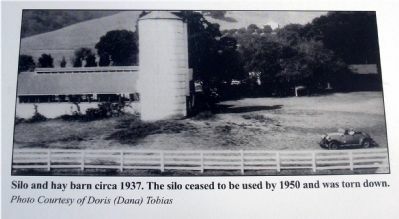 The original silo and barn were much larger. Silage, fodder for animals, is created by partially fermenting agricultural products, such as corn stalks, to enhance their nutritional value and preserves them for winter feed. Erected 2008 by Alviso Adobe Community Park. Location. 37° 39.596′ N, 121° 54.782′ W. Marker is in Pleasanton, California, in Alameda County. Marker can be reached from Old Foothill Road near Foothill Road. Touch for map. 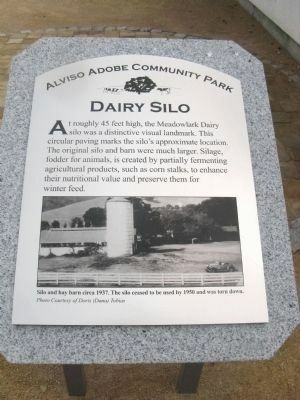 Marker is located next to the hay barn interpretive building at Alviso Adobe Community Park. Marker is at or near this postal address: 3465 Old Foothill Road, Pleasanton CA 94588, United States of America. Touch for directions. shouting distance of this marker); Alviso Adobe (within shouting distance of this marker); Alviso Adobe Community Park (about 300 feet away, measured in a direct line); The Heritage House (approx. 1½ miles away); Rancho El Valle de San Jose (approx. 1.6 miles away); Gay 90's Pizzeria (approx. 2 miles away). Touch for a list and map of all markers in Pleasanton. Silo and hay barn circa 1937. The silo ceased to be used by 1950 and was torn down. Photo Courtesy of Doris (Dana) Tobias. The current business runs as a retail store in Downtown Pleasanton. 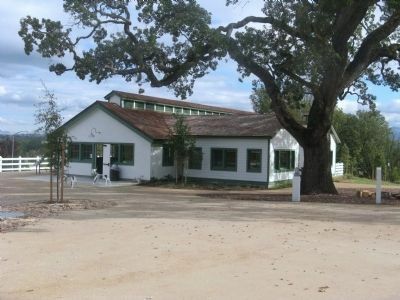 This drive-thru creamery is noted for its ice cream and is still an intricate part of Pleasanton heritage. 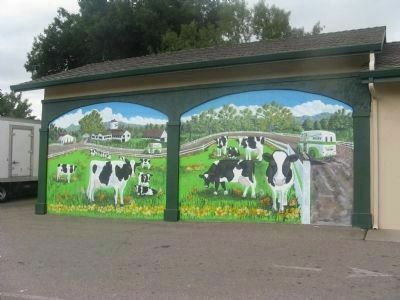 An illustration of the dairy farm at the Alviso Adobe is depicted in the artwork of this mural. More. 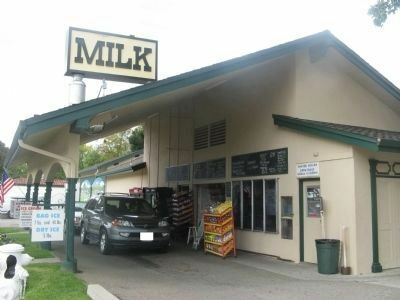 Search the internet for Meadowlark Dairy - The Dairy Silo. Credits. This page was last revised on June 16, 2016. This page originally submitted on November 18, 2009, by Syd Whittle of El Dorado Hills, California. This page has been viewed 1,870 times since then and 6 times this year. Photos: 1, 2, 3, 4, 5, 6. submitted on November 18, 2009, by Syd Whittle of El Dorado Hills, California.